Ergonomic instruments have been invented and improved for more than ten years! But even if you are playing with pain, you may not be aware of this. Don Ehrlich of San Francisco with his ergonomic viola. This article about Don Ehrlich, a violist in San Francisco, appeared in The New York Times in 1997. It surprised me then, and continues to be extremely relevant. My surprise centered around others’ surprise at seeing an ergonomic instrument being played in an orchestra rehearsal. And, since I’m a pianist who plays occasionally in orchestras but not every day, it was an education to read about a player’s discomfort in an orchestral situation. Some time later, when providing information for a doctor who wanted to publish on musicians, avoiding injury, and ergonomic issues (he had treated me in the 90’s), I did a search for “ergo viola.” What a wonderful thing to come across Don Ehrlich’s photo with his ergonomic viola! That’s progress! Ergonomic instruments were being accepted! Don Ehrlich’s bio provides further information. Come back soon… he has agreed to be a guest blogger! Someone who knows instruments and ergonomics can watch you play. Even changing the angle of your hand by only 1/4″ can make a huge difference. During my recovery from computer injuries, one such person Xeroxed a computer keyboard, literally, so I could practice. He turned the keyboard upside down, copied it in 2 parts, and taped the 2 sheets together. He and my doctor also watched me play, making suggestions that saved my playing. The same can be done with a bassoon keyboard, for example. Copy the fingerboard. Then the paper can be folded so the finger holes are closer together. This allows the player to practice, in a way, with greatly reduced strain. Frustrating, yes, but far better than nothing. One more thought: the single best thing you can do to protect your hands is something I’ve been thinking about all week. When you use your hands, are they free? Or are you holding other objects, say, when you enter a phone number? If you’re holding a pencil, put it down before you use the phone. Need proof? Try it both ways. Holding a pencil, even though it’s so light, strains your hand by pulling your fingers out of alignment. Now let’s go into the kitchen to look at something that happens every day. How do you open the refrigerator? Sometimes I have groceries in my arms, opening the refrigerator door with… one finger. The door is heavy, requiring strength to open. Putting all that stress on one finger is to be avoided! Set down whatever you’re carrying first. Then use your hand, arm, shoulder, and back. Hampshire has several oak trees, and there are many oak leaves on the sidewalks. Quite a few fell stems up! So the sidewalks are gray, with a brown leaf pattern. The stems look like giant thumbtacks. Seeing that made going over there worth the trip, even though rehearsal was cancelled and I didn’t get the message. Im sittng undr metal roof @ hamp coll hopng pourng rain lets up. foliage still fab altho harder 2 c thru foggy windows. This afternoon around 2:30, I left to go to Hampshire College on the bus. En route, I saw 2 of the coolest trees ever! One was @ North East St. and Pelham Rd. ~ the other on Rte. 116 just past Amherst College. Then, at Hampshire, the big oaks had started turning from green to brown. Right now they look like dark bronze. I don’t remember seeing any of this in prior years. It’s all about the combination of rainfall and temps, and changes every year. When leaving Hampshire at around 6 p.m., the trees still looked gorgeous, even though it was almost dark. The sunset had pink clouds in a light blue sky. A few minutes later, the sunset was dark red on the horizon, the same color as dark red bushes (the color “burning bush” is at its deepest). Around 6:30, the 1/2 moon and North Star lit up the sky to a dark blue indigo. This will all go away soon enough… I’m loving it while I can! If you are like many instrumentalists, you have a well-developed capacity to block things out while practicing. Do you lose track of time? Forget to eat? I actually don’t feel hungry when I practice. Paying attention to the amount of time you’ve been at it and the last time you ate are crucial considerations in maintaining your ability to play your instrument. I am writing about injuries today as I am recovering from surgery (not for that!). My old injuries resurface mildly from time to time. Triggers include being tired, cold temperatures (weather or a/c), humidity (it’s raining), being not quite 100% physically (i.e., coming down w/a cold), and being stressed (i.e., rushing to meet a deadline). Emil Pascarelli, M.D., who treated me in NY in the ’90’s, has two informative books on the subject. I credit him with saving my playing after being injured by trying to meet impossible deadlines at my high-pressure word processing job, using bad posture (slumping back in chair, resting wrists on edge of desk), and not taking breaks. In addition, there is an excellent book by a physical therapist who trained w/Pascarelli. The more you know about signs of potential problems, the healthier you will be. Are you aware of the way you use your hands when you are away from your instrument? How do you open a door? Wash dishes? Lift objects? Hold the hairdryer? Write? Rather than using only your hands and fingers, try to use your entire arm, shoulder, and back. Are you supporting your upper body with your legs? Do you get enough exercise? Eat healthfully? Have decent posture? Ergonomic tools can help a great deal. Can openers, jar openers, whisks, graters, and many other things are available with large grip handles. My grater has 2 panels with a handle on top & rubber feet on the bottom. So it’s easy to hold, has good angles for grating, and won’t slip. When you have to grip tightly or narrowly, your hands are straining. And adding the problem of slippage means that you have to work harder just to keep the object in place so you can use it. When you carry a shopping bag, use one w/handles. You can then hold onto the handles and hang the bag straight down from your shoulder. Holding paper grocery bags, for example, out in front of your body causes a great deal of strain on your arms and back. It’s tiring. For some time after I was injured, I was unable to wash heavy plates. So, reluctantly, I went shopping for plastic. A plate can be placed on the floor of the sink and washed that way, w/o holding onto the edge (very bad angle ~ the weight of the plate is only held by maybe 3 unsupported fingers). Going for lightweight objects was worth the compromise. It might be valuable to you if you begin to make a point of noticing your hand/arm/shoulder position throughout the day as you do various tasks. Do you use your back muscles? 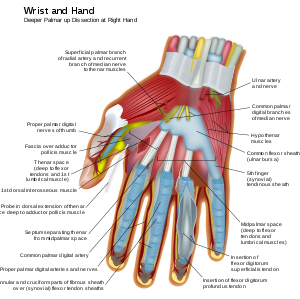 Large muscles can protect the small muscles in your fingers, but only if you use them. I hope this helps… when you have sustained injuries, you become aware very quickly. I am advocating that you be aware in advance so you won’t have to go there. And if you know the warning signs and heed them, you won’t. My trip from Amherst to Hampshire College on Wed. was gorgeous! At a little after 3 p.m., the trees were backlit by the sun. When passing a yellow tree, the air turns yellow too. And there are enough leaves that have fallen to turn the ground yellow. The clouds were long and horizontal, flat on the bottom, puffy on top, with blue sky in between. Some trees had 3 colors on each leaf, like spots. Green, red, & yellow. I don’t remember seeing that on a large number of leaves before, in exactly that way. Wonder what causes it? On the Hampshire campus, I stood under a yellow tree to experience the yellow light even more. A professor I had in an English Romantic Poetry course in England said that the best way to look at a tree is to lie on the ground w/your head next to the trunk and look up. We were @ Oxford then. 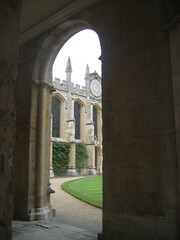 The rose garden @ New College was an excellent place to try out his suggestion. I stood this time, back to the tree. When you look up, you see the tree in a whole different way. They way it grows, how strong it is, the sky above, the way the bark looks… many things that would likely go unnoticed without close observation. A tree near my building has lost nearly all its leaves. I was happy to be able to observe a titmouse festival. When Mass. becomes cold and gray for the winter, I’ll read this post and imagine the Fall scenery. And I hope if you live someplace where it gets cold, you will too. Spring is a long time away! Every rehearsal is different. I’ve been thinking about what rehearsal playing requires and how the requirements change every few seconds. 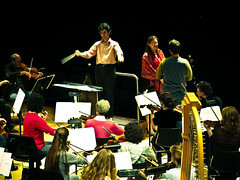 If you are a soloist, you will find yourself thinking about everyone else during rehearsals for the first time. The way rehearsals proceed may be new to you. It’s a completely different ball game. Playing for singers one-on-one is also very different. The amount of space between sounds in a larger rehearsal has just increased enormously. In addition, there are many more voices and vocal lines, plus a conductor. You may be required to rehearse in a space with bad acoustics. The way you play (shorter or longer notes, more accents, less pedal) will be a great help. Most important ~ keep the rehearsal moving. Watch the conductor, listen to the singers, anticipate what is needed. The pianist should know intuitively where the conductor will start after a break to discuss a passage. (How? Listen to the discussion! And remember what happened just before the conductor stopped. Chances are, that’s the spot.) Give pitches near the end of the discussion, before the downbeat. If more time elapses than you had anticipated, give them again. If your hands remain on the keyboard, chances are much greater that you will be there when needed. Early. From time to time, I have encountered a conductor who doesn’t know the music. Maybe the composer is new to him/her. What is appropriate here? Must you always “follow” the conductor? I tried playing the parts unobtrusively, so as to help the rehearsal progress but not to call attention to the situation. It worked. Sound as much like the orchestra as possible. Listen to recordings so you know the orchestration and can reproduce the sound. A solo flute sounds completely different from a solo trumpet, for example. And those arpeggiated chords in piano reductions are often added when the stretch is too wide for the hand to reach. They do not often indicate a harp part. So why would you arpeggiate them? Find another solution. After piano rehearsals are over, the singers will have to adjust to the sound of the orchestra from the distance of the stage to the pit. Often from the back of the stage to the pit. It is your job to help them make that transition. The singers have much more to think about here. Your job is to play the orchestra part prominently and very clearly. Follow the conductor, not the singers. You should be overplaying. An exagerrated crescendo (when marked in the score) before a singer’s entrance, for example, would be welcomed. Any musical cues must be prominent as well. Rhythms need to be emphasized, as the singers are most likely not looking at the score. (Is it a triplet or a dotted rhythm? Make it clear.) Also important are key changes, accidentals that could sound like mistakes, meter and tempo changes. When the articulation changes from staccato to long legato phrases, emphasize that. If there is a secondary part that matters, play it, even when rehearsing a single line. This does not mean that you mark, too. Everyone needs to hear the orchestra. Balance is not the issue. You will not be able to listen for ensemble, so just play it like it goes as much as you can. Of course you will be singing the solo part so you know the time needed to prepare for and reach a high note, say, and to breathe with the music as the singer would. A singer who is marking is feeling vulnerable. You can help her/him feel secure. Any especially difficult page turns must be dealt with before the first rehearsal. Copy what you need to, then use tape so everything remains secure. Stopping a rehearsal so the pianist can catch up is a waste of everyone’s time, and avoidable. The goal is to be helpful, not get in the way. Repeats and cuts ~ same solution. If they involve turning more than one page, mark them with post-its. Please leave a comment if you have additional suggestions. The Sunday, September 27th issue of The New York Times includes a fascinating interview of Barbra Streisand by Anthony Tommasini, a classical music critic. Streisand talks about how conveying words was one element of singing that “hooked” her initially. While living in NY, I played for an actress’s voice students. That experience was intriguing. Her students were taking lessons to see if they might want to do a singing audition sometime. They were already accomplished actors. The focus was different. Singing was accorded less weight/importance as a life goal with each student I encountered. And since actors work with words every day with no melody, these voice students put the words first. When learning a song or role, what do you do first? Learn the melody? Hear the harmony in the piano/orchestral part? What about the text? You need to make the text your first priority. Perform it out loud dramatically. If you are preparing a song or role in a foreign language, you must translate the text first, before any singing takes place. Your dramatic performance in English will come first. And then you will be comfortable doing the same in the language of the piece. I sometimes use pre-existing translations, but always check out every unfamiliar word. Knowing where to be expressive and with what emotions is crucial to the integrity of your performance. A word for instrumentalists, too: when playing works that were composed with words, it is extremely important to know the text. You need to sing the piece and proceed with your breathing plan cognizant of a singer’s requirements. Finding out where to breathe does not require that you be a great singer, by the way. It’s about paying attention to the phrasing and knowing how much air you need. Experiencing that you need more breath to sing a long phrase or to reach a high note will make an enormous difference in your own phrasing.